#1 What Material Options Do I Get? 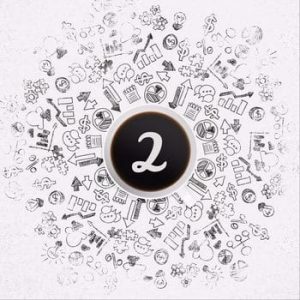 #2 How Many Design Options Are There? 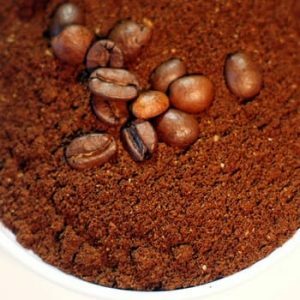 #3 How Easy Is It To Brew A Cup? #4 What Grind Size Does It Require? #5 Is It Portable Enough To Travel With? #6 Brew Time - How Long Until I Get My Coffee? #7 What Filters Does It Use? #8 How Many Servings Do I Get Per Brew? #9 Is There A Difference In Taste? #10 How Long Before It Breaks? #11 How Easy Is It To Clean? #12 What's It Going To Cost Me? If I had to reduce my collection of coffee paraphernalia I’d whittle it all the way down to my trusty French Press and my Aeropress. And then I’d have to stop. Reducing it any further would be like having to tell my kids which one of them was my favorite. 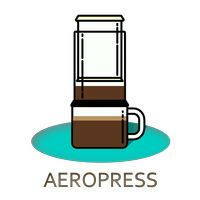 The Aeropress vs French Press discussion is a subject that crops up regularly with coffee connoisseurs willing to argue both sides. I have, and enjoy using, both brewing methods and feel that it really comes down to timing, quantity and the taste you’re after. If I’m after a quick cup for myself and my wife then I grab the Aeropress. When I’ve got polite company it’s time to hide the plastic and bring out the silver. That’s when the French Press comes into its own. 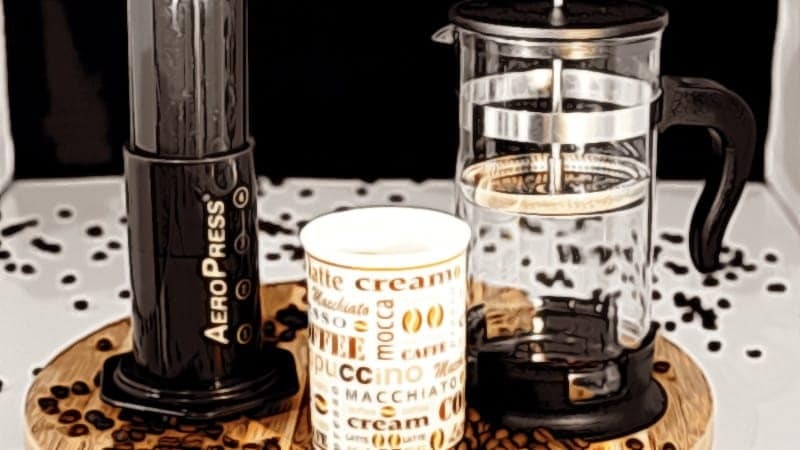 The French Press is a centuries old, tried and tested coffee brewer whereas the Aeropress is a coffee upstart having only been around for a little over 10 years. Both can be considered full immersion brewers because the coffee grounds sit in hot water before being separated. They will also both generally give you a better cup than you’d get from a simpler pour over device where the water flows straight through the grounds. And that’s where the similarity ends. Here are twelve features that differentiate these two great coffee makers. No material variety options available. Only comes in BPA free polypropylene plastic with very little concern given to appearance. Comes in a variety of materials including glass, ceramic, stainless steel, plastic and stoneware. Materials are attractive but some choices present durability issues. If you like variety then the French Press offers you plenty when it comes to the materials it’s made from. It will have either a ceramic, stainless steel or glass body with stainless steel filter and plates. The tactile and visual experience of using these materials does add an element of finesse to your brewing routine. The Aeropress is all business and only comes in polypropylene plastic with a rubber end on the plunger. With plastic there’s always a concern about health issues but the Aeropress is made from BPA free materials so there’s no issue there. If you insist on avoiding plastic then unfortunately the Aeropress offers you no other options and you’ll have to stick with a French Press. Glass or ceramic may have a more aesthetic appeal to it but when it gets dropped it stops being pretty. If you’re a bit clumsy first thing in the morning then a full stainless steel French Press is a better bet. Comes only in one size and shape. Each aspect of the design is functional with no aesthetic design elements. Not exactly an attractive piece of equipment. Comes in a variety of attractive designs from simple to elegant. Function combines with form to produce something you’d be happy to have on the table. Being a coffee drinker I do sometimes experience some bling envy when I see elaborate silver tea sets. While taste is what matters most, it’s nice to be able to take an attractive coffee brewer out when you have guests. 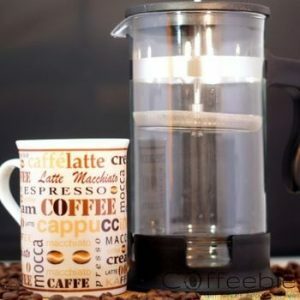 The variety of designs that a French Press comes in affords you plenty of choice. Whether you’re looking for something elegant or if you prefer a cleaner, more modern design, you’re bound to find one that pleases your discerning eye. 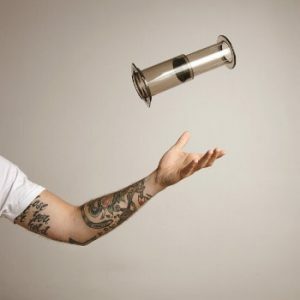 The Aeropress is all function and no form. It only comes in one design and it’s not exactly pretty. Let’s be honest. It’s basically a big syringe. There’s some entertainment value there if your guests haven’t seen one being used before but other than that you should probably just leave it in the kitchen when you bring the coffee out. If your guests raise their pinkies when sipping their coffee then you’re definitely going to want to take out your prettiest French Press. Between inserting the filter, not knocking it over and pressing the plunger down evenly it requires focus and a fair amount of practice to get it right. Efforts are rewarded with good coffee every time. It’s simple to use and is ideal for no mess, no fuss, consistently good coffee. 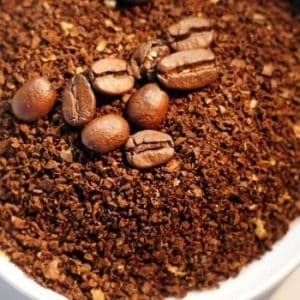 Grind size, coffee water ratio and brew time is important for best results. Both the Aeropress and the French Press are fairly easy to use but getting a consistently good cup does take a little practice and some refinement of process. 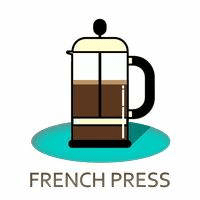 The French Press is probably the easiest of the two to use because there are a lot less moving parts to co-ordinate. You need to get your brew time and coffee water ratio right if you want consistency though. It’s a lot less fiddly than the Aeropress so if you’re only semi-conscious before your first cup then this is the way to go. The Aeropress requires a defter touch and presents more opportunities for accidents. Being long and narrow it’s pretty easy to knock over, especially if you’re a fan of the inverted method. It’s physically challenging too. It takes quite a bit of pressure to depress the plunger and you’ve got to maintain that pressure for around 30 seconds before the plunger is fully depressed. Also, if you don’t press the plunger straight down and evenly in the beginning you’ll have coffee squirting out at you. When it comes to brewing a good cup an Aeropress is pretty forgiving. Even if you rush the process or vary the grind it’s hard to get a bad cup out of it. With some refinement of process an Aeropress will reward you with great instead of just good. Getting the timing of the initial pour and the brew time right as well as the plunger pressure has a big effect on the end result. Paper filter allows for finer grind size with no sediment passing through into cup. Metal mesh filter requires a coarse grind so that grounds don’t pass through when pressing. The coarseness of the grind can have a significant effect on the depth of flavor you get as well as the brew time required. With a French Press you’re limited by the filter that it comes with. It’s not a very fine filter which means that you need to grind the coffee coarser than you do for the Aeropress. For a French Press you’re going to need a burr grinder so you don’t end up with grinds that are too fine. The coarser grind results in less of the coffee surface area being exposed to the hot water which is why the brewing time needs to be longer. The Aeropress uses a paper filter so you can grind the coffee a lot finer. A burr grinder works great for this if you’re after consistency but a blade grinder would work too seeing as you’re after anything in the medium/fine grind range. The Aeropress is far more tolerant when it comes to grind size and this also allows you more variety in the cup you’re trying to make. Being plastic and small makes it ideal for traveling. 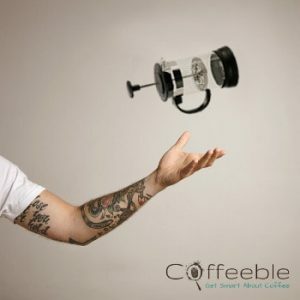 Aeropress grinder is a great addition if you’re not going to be anywhere near a power outlet. Doesn’t travel well due to bulky size and more fragile materials. Finding good coffee when traveling isn’t always easy. Often your best bet is to take your coffee gear with you. 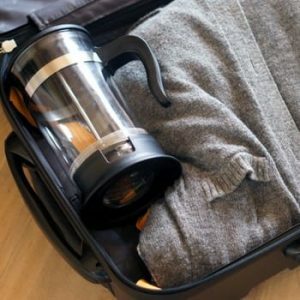 There are some smaller travel French Press options that are more portable but in general the more fragile materials and bulky nature means they don’t travel well. 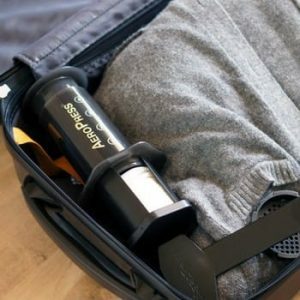 The Aeropress is highly portable and its rugged design and durable materials mean you can throw it into your travel bag without too much concern. Its individual bits fit nicely into each other so it takes up very little space. There’s even a great little grinder available that fits right on top of the Aeropress. Being plastic, the Aeropress isn’t going to set off any alarms when you pass through the ﻿﻿TSA checks at the airport. Fine grind and pressure mean you only need 1.5 minutes to make a cup. Perfect if you’re on the clock. Coarser grind requires 4 minute brew time to fully extract flavors. No problem for a leisurely cup but not great if you’re in a rush. The French Press is a set and forget kind of brewer. Once you’ve added the coffee and hot water you’ll have to allow for about 4 minutes of brew time. This is great if you’re easing your way into the morning but not so great if you’re in a hurry. There’s no rushing this process though. Press it too early and you’ll have thin, watery coffee. The Aeropress doesn’t give you any chance to sit. From start to finish it takes about a minute and a half. Because the coffee is a finer grind you get a good extraction during the immersion stage. The pressure you exert when depressing the plunger then gives you that espresso effect by getting even more flavor out of the coffee without the wait. 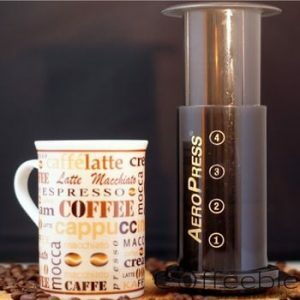 This makes the Aeropress a great option if you need a good coffee before rushing out the door. You need to insert a disposable paper filter each time you use it. The filter allows for variations of fine to medium/fine ground coffee. A permanent metal filter is available if you want to retain coffee oils in brew. Uses a semi-permanent, built-in filter. The filter works well with a coarser grind but lets some fine sediment through. 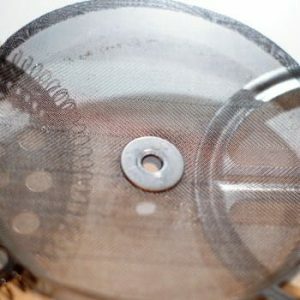 A French Press uses a built-in stainless-steel mesh filter. The advantage of this is that you’ll only need to replace it about once a year. It’s not a very fine filter though, so it does end up dictating your grind size as mentioned above. Because the filter in the French Press isn’t very fine it inevitably lets some of the finer sediment through into the coffee. Some people like the mouth feel this provides while others prefer the cleaner brew you get by filtering with paper. 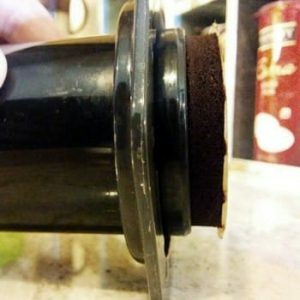 The Aeropress uses disposable paper filters so you’ll eventually have to buy another pack of filters. The pack that comes supplied with the Aeropress will last you ages though. Being paper allows you to grind the coffee as fine as you like while not letting any of the sediment through into the cup. The filter removes the oils as well which may or may not suit your particular taste. If you want to retain the oils you can buy a permanent metal filter that will let these through. Two’s company, three’s a crowd. Only makes 1 to 2 cups per brew so it’s fine for a couple but impractical beyond that. Makes anywhere between 1 to 8 cups per brew which makes it ideal if you’ve got guests. If you’ve got guests then the French Press is the way to go. Depending on the size of the press you could make up to 8 cups or even more per brew. If you only want a single cup the French Press is fine for that too. The Aeropress is only going to give you 1 or 2 servings per brew. This means that if you’re making 6 cups you’ll have to go through at least 3 rounds of brewing, filters and cleaning before everyone is happy. If you’re making coffee for yourself and maybe one other person then grab your Aeropress. More than that and you’re better off going for the French Press. Clean cup with lighter body but more flavor. Individual coffee flavors more distinct due to filtering of oils. Full bodied, robust and thicker coffee. Individual coffee flavors less distinct. A French Press will give you a more robust, full bodied and rich tasting coffee. Because you end up with some of the fine sediment coming through you end up with a thicker tasting brew but you want to watch out for that last sip to avoid any grind sludge. The coffee oils make it through the mesh filter giving you that robustness but also tend to muddle the distinct coffee flavors. 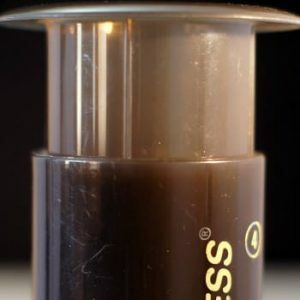 An Aeropress gives you a cleaner cup of coffee with lighter body. Because the oils are removed by the paper filters it’s less robust but with more distinct individual coffee flavors. Metal filters are available if you prefer the flavor profile that you get from French Press. The pressure exerted during the plunging stage tends to extract more flavor from the coffee than you get from the simple immersion that the French Press offers. Made from tough plastic so it’s pretty much bomb proof. Glass not very durable. If you want a more rugged option then skip the glass and go for stainless steel. The materials that a French Press is made from mean that it is inherently less durable than an Aeropress. Glass will eventually break and even stainless steel will end up with a few dings. The mesh filter will also need to be replaced every year or so. The Aeropress is made from tough plastic so you’ll have to try very hard before managing to break it. After a few year’s use the seal between the rubber plunger and the inside of the brew chamber gets a little iffy and you’ll need to buy another Aeropress. The low cost means it’s not such a big deal. Super easy to get rid of grounds and rinses clean under water with very little effort. More difficult to clean and getting the filter completely ground free takes some effort. Cleaning a French Press can be a bit of a pain. Coffee grinds tend to get stuck in the filter so it takes a bit of effort to get it looking pristine again. If you’re using a glass press then you need to be careful when dumping the grounds. Knock it too hard against the bin and you’ll have to throw it in the trash along with the grinds. Cleaning the Aeropress is a piece of cake. 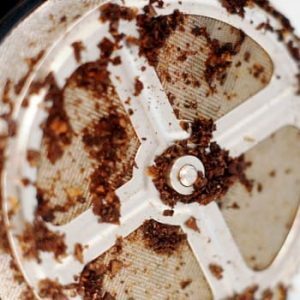 The coffee grounds compact into a little puck at the end of the brew chamber. Take off the filter holder, aim the end at the trash can and press the plunger down to eject them along with the filter. There’s no filter to wash and the rest of the pieces rinse clean under some water. Only one option costing around $30. A few aftermarket accessories are available. Plenty of options from $10 to over $100 depending on materials and design. 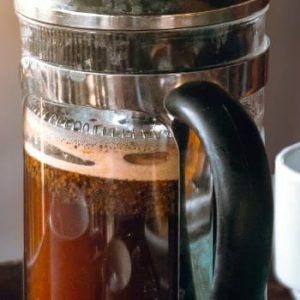 You can get a French Press for anything from $10 from a store like Ikea up to as much as $100 or more if you want a high-end stainless steel or stoneware unit. Paying more doesn't necessarily result in a better cup of coffee but durability and appearance will be what you’re paying for. With an Aeropress you pay one price. That’s it. They normally cost around $30. Want a cheaper option? There isn’t one. Want a fancier one? You’re out of luck. 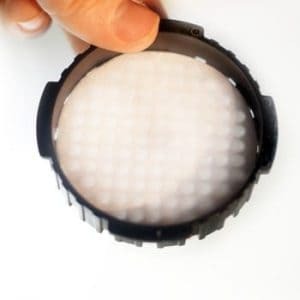 You’re going to have to buy some filters eventually (they’re cheap) and you can buy some other add-ons like a metal filter, hand grinder or a nylon bag if you plan on traveling with it. As you read each of the pros and cons above you probably thought: “Oh, so the French Press is better”. And then with the next point: “Oh wait, so the Aeropress is better”. The truth is that both options make great coffee and there’s a time and a place for each one. The French Press is visually appealing, easy to use and makes great coffee for a couple of people but it takes time. The Aeropress makes great coffee quickly but it takes some practice, it’s not the prettiest and only really practical for one or two cups. If you’re trying to decide which one to get then have a look at the differences to see if there are any deal breakers. If the French Press vs Aeropress choice has left you feeling a little indecisive then we’ve got something in common. I couldn’t choose one over the other either. My advice is to get one of each. Problem solved!